Wobage warmly welcomes Ana to begin work at the pottery from September 2012, following graduation in summer 2012 from the Ceramics BA(Hons)degree in Cardiff. 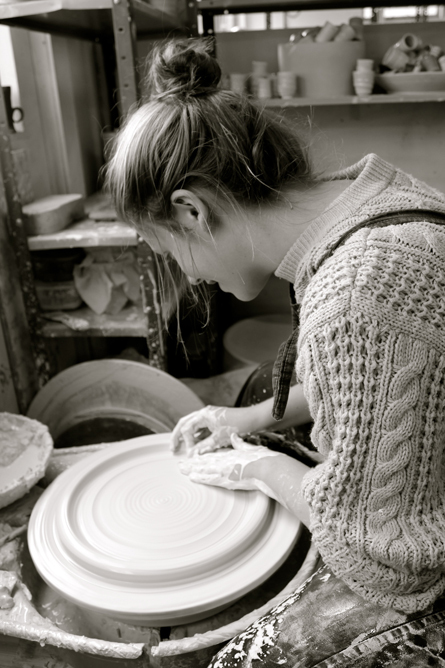 She works in wheel-thrown porcelain. Broad throwing lines describe the spontaneous gesture of the maker’s hands, whilst capturing the malleability of the soft porcelain she uses. These marks which are key to Ana’s functional shapes, are enhanced by a quiet palette of fluid reduction glazes, fired to 1280˚C. Ana will share space in Jeremy’s studio, where she will be part-time apprentice. Ana and Jeremy jointly run a 10 week block of evening classes on a Tuesday. For availability for this class, or to join the reserve list for subsequent terms, please contact us via bookings. For more information about Ana’s own work, please visit her own website.